Important tasks can easily get delayed or halted if things don’t go as expected. This tool helps people think through what might go wrong, and agree some alternative ways of getting things done. 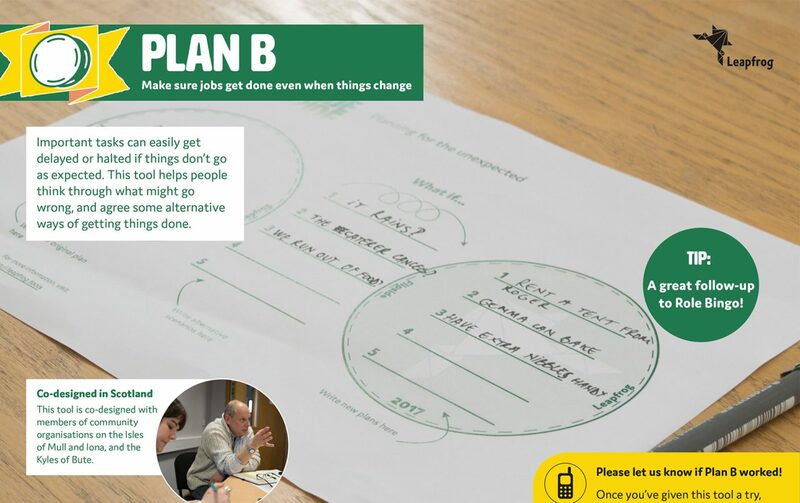 Plan B helps teams to prepare for changes at the start, when events are being planned. Write down your key tasks on the Plan B sheet, think of what could change in your plans and prepare alternative ways to move an event forwards. Plan B was co-​designed with members of community organisations on the Isles of Mull and Iona, and the Kyles of Bute.